London, August 28, 2014 � Writing on mademoisellerobot.com, fashion blogger Laetitia Wajnapel called her PEN "the ultimate fashion blogger camera". Pick up a new Olympus PEN E-PL7 and you will start to see why. PEN designers clearly understand something other camera brands often miss: people with an eye for style and first-class, creative photography don't want a bulky, plastic SLR spoiling their carefully crafted, personal look. When they glance in the mirror, they want their camera to make them look even better. Not that you need a mirror if you own a PEN E-PL7. Its LCD flips down and around so you can frame and shoot a series of pre-timed, sequential still or video selfies without your hand blocking the shot. Or without even touching the camera, by simply tapping your smart phone. The E-PL7 may be disguised as a fashion icon � and as easy to use as a phone � but in truth it's a cutting-edge, pro-standard beauty with a range of equally stylish accessories and on-camera creative effects to match. It's available in eye-catching white, vintage-style silver or classic black from early October 2014 for �499. That includes a slim-line, high-grade Pancake Zoom lens and the OI.Share app for shooting and sharing images via WiFi on a smart phone with Android or iOS. An interchangeable-lens camera that lets you release the shutter remotely from your smart phone is nothing new. 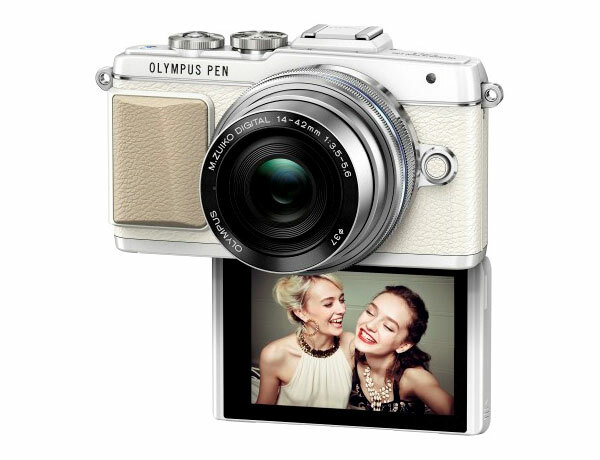 But the new Olympus PEN E-PL7 lets you get really creative before you do. You can zoom in and out without touching the camera, or adjust key settings like aperture and shutter speed in real time and preview the effect live on your smart phone's screen. Using simple controls on your phone, you can set the PEN's self-timer to take stills in quick succession � for a full-length, paparazzi-style sequence. Or switch to close-up, adjust the interval, and shoot different poses just like a photo booth. The PEN's tiltable LCD is touch-sensitive, so it's ideal for ‘old-school' selfies too. Flip it down and around and the E-PL7 automatically goes into ‘selfie mode'. The EZ lens zooms out to wide angle and the LCD becomes a 3-inch mirror, with buttons for selecting a self-timer sequence, e-Portrait or shutter release � simply by tapping the screen. No matter how light your camera is, if you hold it up with one hand long enough to record a sequence, rotational blur is always an issue. Olympus fitted the latest PEN with their industry leading 3-axis Image Stabilisation technology for this reason. In short, this counteracts rotational hand movements much more effectively than regular systems in comparable cameras. Good to know! One beautiful design deserves another, so Olympus supplies a range of accessories for the OLYMPUS PEN E-PL7 that includes retro-styled, matching body jackets, lens caps and straps, in sumptuous, head-turning leather. But as blogger Julia Rebaudo from Stylonylon.com points out, this camera is about much more than gorgeous looks: "Discovering PEN was an absolute revelation for me! The range is small, light and stylish but with incredible versatility and image quality. They are without a doubt, the perfect cameras for bloggers." It goes without saying that the E-PL7 delivers images of the very highest quality, even in low light, as it boasts much of the powerful technology used in Olympus' high-end OM-D series cameras. But it's most likely the myriad of creative options, plus super-easy shooting and sharing that will wow the most dedicated fashionistas. Easy-to-use options and seamless online connectivity can't fail to impress the blogosphere's best. "The Olympus PEN system has helped me gain confidence in my photography, to the point that it has become an integral part of my work�.everyone always comments on the look of my camera and I promptly add that it packs in a lot of technical prowess too!" says Laetitia, whose blog gives fashion advice to thousands of readers every month. For example, Live Guide, which lets you intuitively adjust settings using a sliding scale on the LCD (no menu navigation required) and check the effect of your changes in real time before releasing the shutter. Live Guide makes it easy to achieve sophisticated, pro-standard effects like bokeh (background blur). Once you've captured your still shot or video, PEN's trademark creative options kick in. Olympus pioneered on-camera image editing and the E-PL7 comes with fully 14 different Art Filters, including the new Vintage and Partial Colour filters. Both include finely nuanced settings so you can try out to your heart's content. Olympus Image Share is a freely downloadable app that makes it quick and simple to pair the PEN with your smart phone via WiFi so you can share immediately with friends � and future fans � on social media. Step one: touch a button on the LCD. Step two: swipe the QR code on your phone across the camera. Done. Now it's time to spread some envy online.